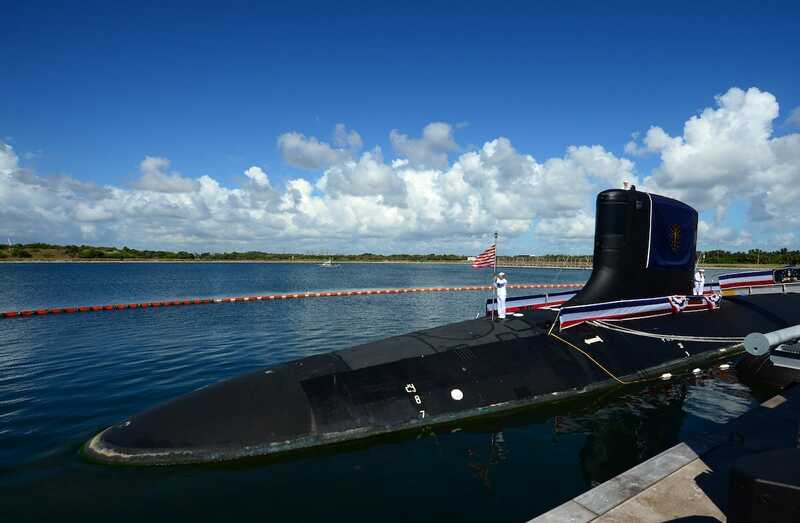 The US Navy commissioned its newest Virginia-class fast attack submarine over the weekend. 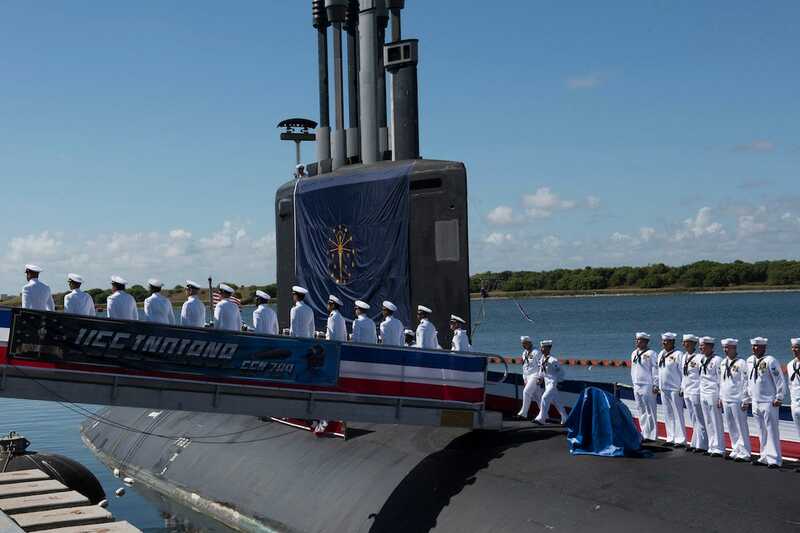 The nuclear-powered USS Indiana (SSN 789), the fourth Navy vessel named after the state of Indiana and the Navy’s sixteenth Virginia-class submarine, entered service on September 29 at a commissioning ceremony in Port Canaveral, Florida. “Indiana is a flexible, multi-mission platform designed to carry out the seven core competencies of the submarine force: anti-submarine warfare, anti-surface warfare, delivery of Special Operations Forces (SOF), strike warfare, irregular warfare, intelligence, surveillance and reconnaissance, and mine warfare,” the Navy said in a press statement. 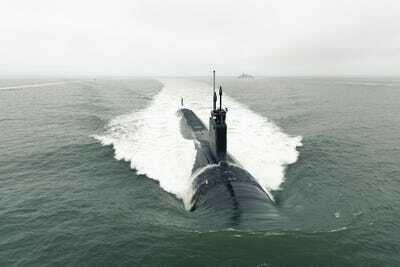 The Indiana is the sixteenth commissioned Virginia-class fast attack submarine, and the sixth commissioned Virginia-class Block III submarine. 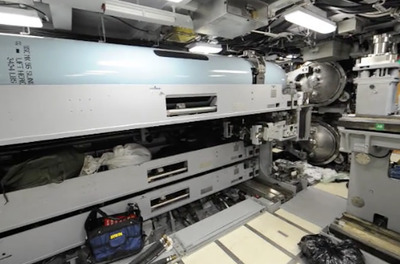 Virginia-class submarines are developed in blocks, with each block having slightly different specifications than other blocks. The Indiana is 377 feet long, 34 feet wide, about 7,800 tons when submerged, and has a 140-person crew. It also has a top speed of about 28 mph. Here’s a shot of the bow, and the two large-diameter Virginia Payload Tubes. Each tube can launch six Tomahawk cruise missiles. 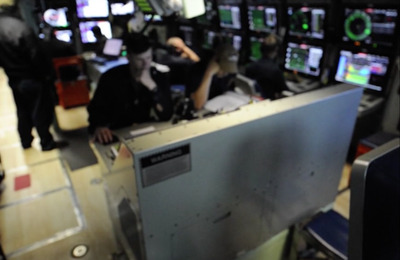 Here’s mission control, which was purposely blurred as the room is highly classified. 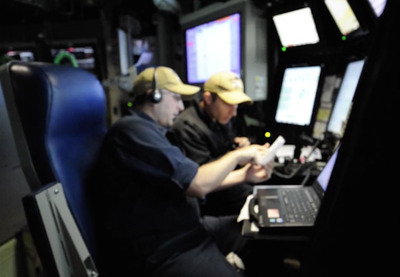 The sonar monitors are along the top right, while the fire control monitors are to the left (not shown), and navigation is in back. Here’s a close-up of the navigation computer. 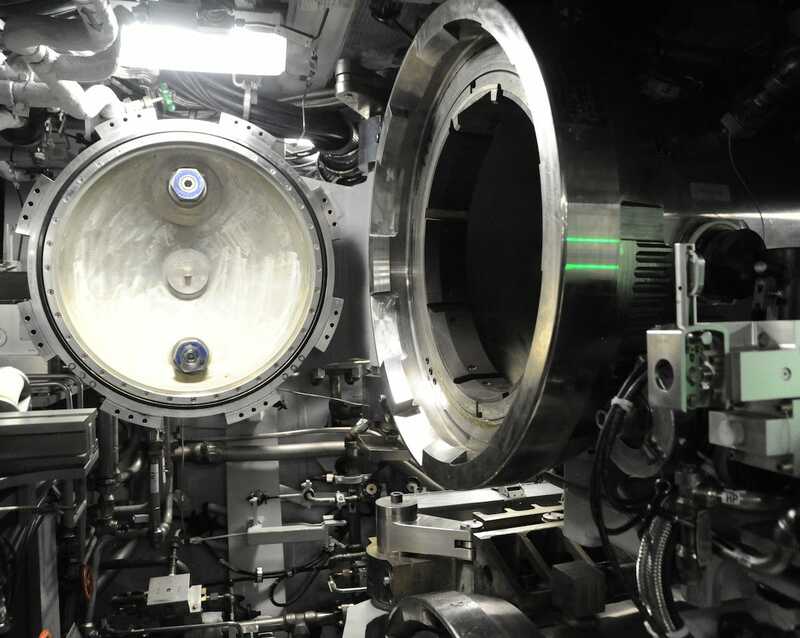 One of the newest features on Virginia-class submarines are advanced periscopes, which are called photonics mast. 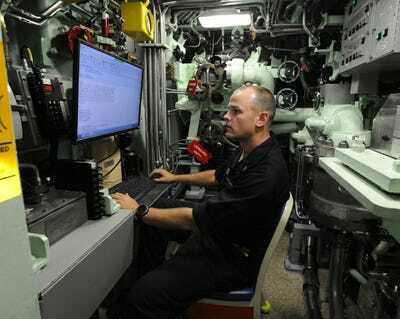 They can be pulled up on any monitor in the submarine, and on the Indiana, are operated by XBOX controllers. And here’s the helm, which is also blurred because of the classified nature of mission control. This is the office of the chief of the boat, the top enlisted on a submarine. The countermeasure launcher is in the background with red tags. This is the torpedo room. 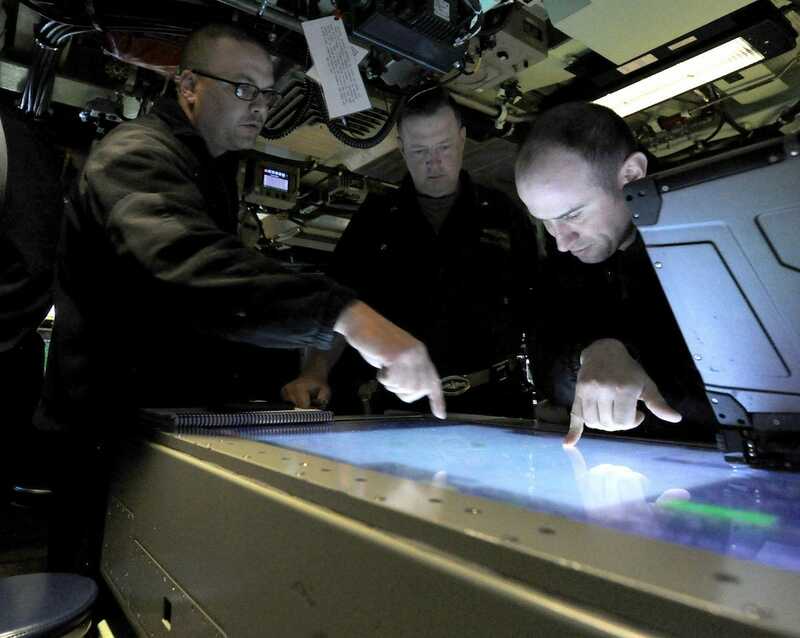 The Indiana is armed with 2,000-pound Mark 48 Advanced Capability torpedoes, which can travel at more than 50 mph on their way to targets. 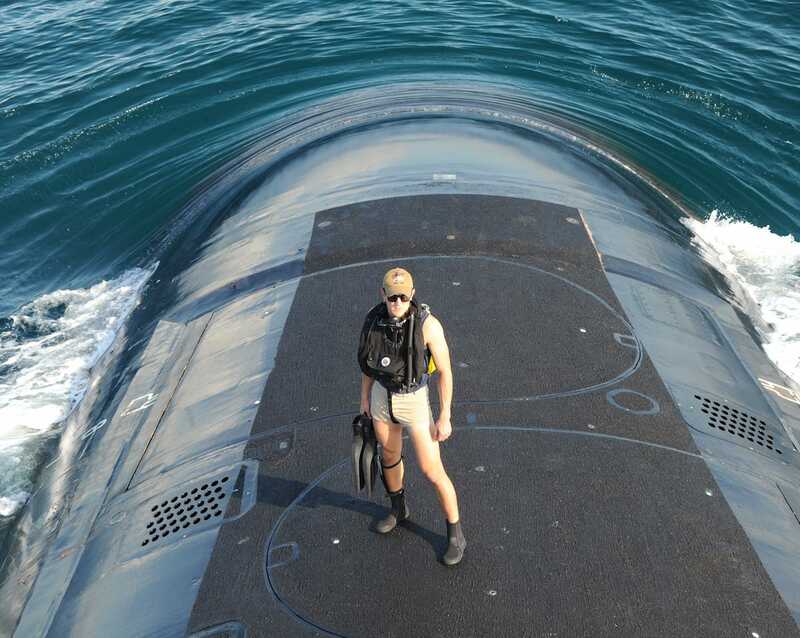 These are some of the most fearsome torpedoes in the world. Here’s a close-up of the launcher. You can watch sailors load one of the torpedoes in the video below (starting about minute three). 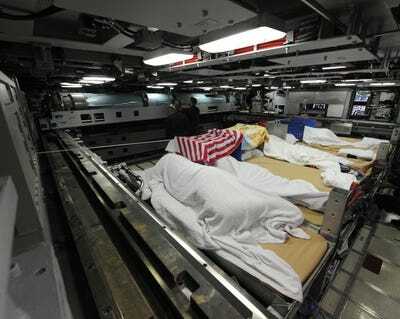 Some of the enlisted submariners have their bunks in the torpedo room. 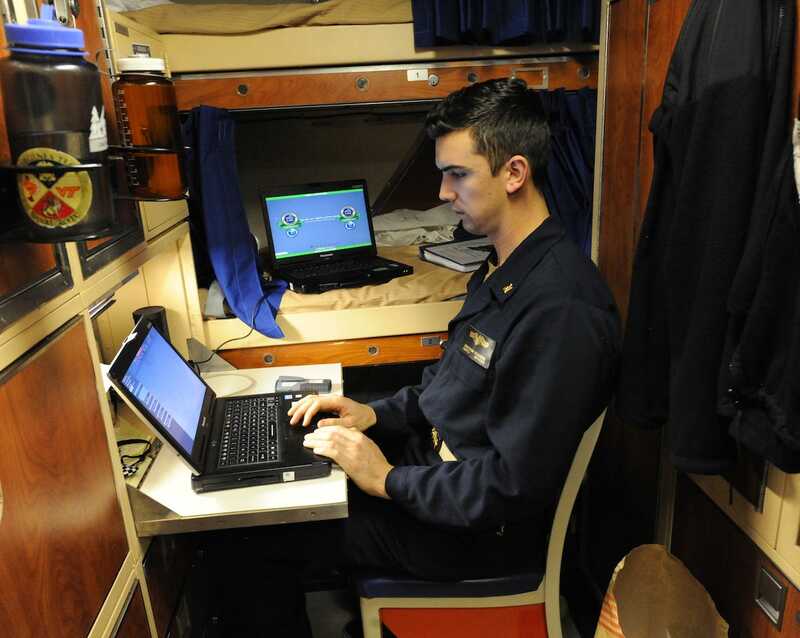 A stateroom like this one, which is occupied by officers, offers more privacy than other berthing areas. Chief Petty Officer Darryl WoodA submariner sits in his birthing area near the galley. 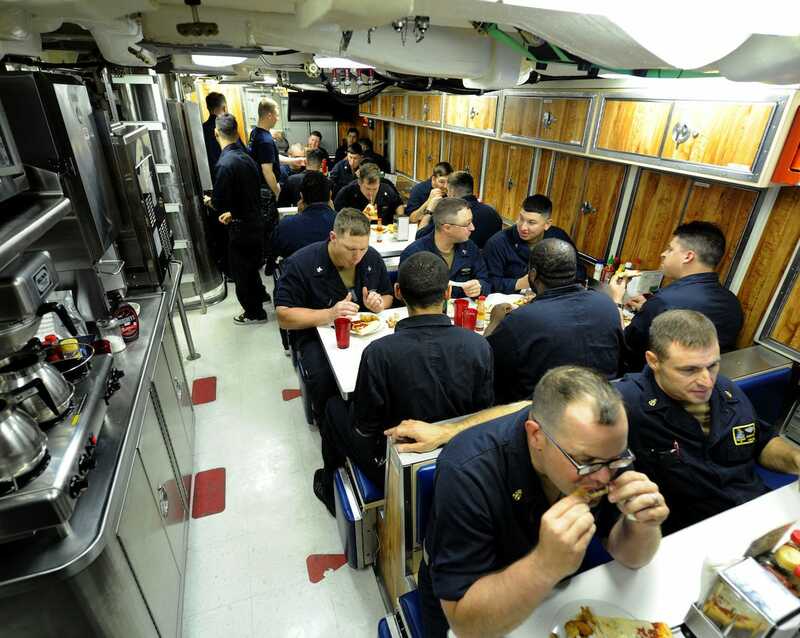 And here’s the chow hall, the largest open space in the ship. Finally, watch the Indiana in motion below.